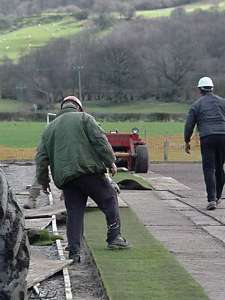 After many years of strife and struggle, the bowling green became a reality on the 18th of April 2001. Letter from club secretary circulated around the village. 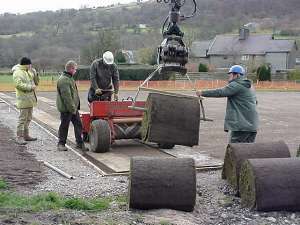 Some may recall that back in November, when the floods occurred, there was some construction activity on the land known as 'Y Wern', down by the school, which extended onto the school playing field. Perhaps you have had a look at it since and wondered what it is all about. Well what you see is the foundation for the village bowling green. 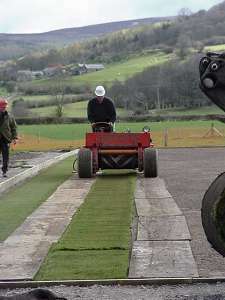 For many years the 'Construction Committee', elected at an open inception meeting held at 'Y Ganolfan', way back in September 1987, have doggedly pursued the objective of constructing the green since that date. After eventually surmounting a considerable number of hurdles spiked with barbed wire, wrapped in red tape, an opportunity to commence the green's construction finally presented it self in September 2000. I must record that without the co-operation of Mr, Ellis Lloyd, Garthiaen Farm, agreeing to sell land to the Club for dedication back to 'Y Wern' this letter could not have been written. As you may know raising funds for the project has been ongoing ever since the inception meeting. This consisted of a number of events held in the early years before the red taped hurdles started to appear, in numbers. However through out the years Ellen Tibbot, Norma Bruce and Delwyn Lewis assisted by other committee members along the way, have run the weekly Tote in the Dudley Arms on Friday nights. The results of the Tote are displayed in The Stores each Saturday. The total monies raised by the Community through the early events and the Tote is some £22.000. An application to the Sports Council of Wales via the lottery fund was successful with the award of a £40,494 grant. Denbighshire County Council has also provided a £4,000 grant, which was a carry forward commitment awarded by the previous authority Glyndwr District Council. 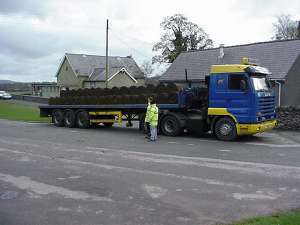 Altogether a sum of £66,494 was available for funding the construction. The project went out to Tender in January 2000 for the third time, the previous occasions failed due to, yes you guessed it, red tape. Having opened the Tender on St David's Day 2000 and undertaken an assessment of the quality of the contractors bids, it was clear that J and FR Associates (Mr James Rothery) offered the club the best quality option. The cost reflected this and was unfortunately some £17,000 above the monies available. Letters of application to the Sports Council for additional funding to match the shortfall was met with a NO response. This happened at the very time that the 'Dome' was awarded £28 million or so survival package, but not one penny more was to come from the sports council. 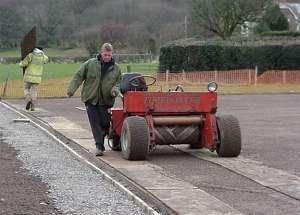 Discussions took place with the Contractor resulting in the £17,000 shortfall reduced to virtually nil by the committee organising large elements of the work rather that the Contractor. To cut the story short an agreement was concluded and a construction programme agreed, Phase 1 to be built in November 2000 with Phase 2 in March/April 2001, securing the Sports Council grant. 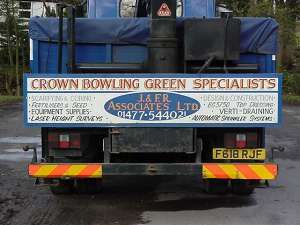 It is now the middle of March, with snow still on the ground, and the return of the Contractor programmed to be on the 28th March. 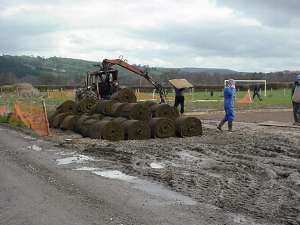 It is intended to get the 'rootzone' material, that is the sandy coloured material you can see at present, prepared to receive the turf grass. 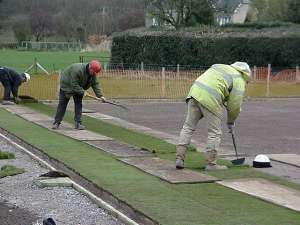 The laying of all the turf will be done in a couple of hours, yes hours, after all years of effort the whole of the grassed surface will appear in hours. The club invites you to witness that event, which is programmed to take place on Wednesday 18th April, weather permitting of course. 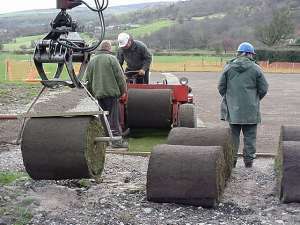 The turf source is from the low-lying areas Yorkshire, east of York, where it has been grown on 'rootzone' material to match that laid for our own green. The turf source fields are stock free and thankfully are not in an area affected by any cases of foot and mouth disease. 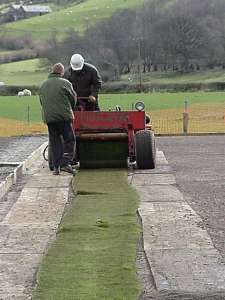 It is not likely that the green will be ready for playing on until next spring, but everything depends upon the coming summer. The annual AGM for the Club will be held in May/June and at that meeting the costs of running the Club plus setting the membership fees will be on the Agenda. Acting as Secretary since that eventful inception meeting I have had the company of several committee members. Unfortunately we lost our previous Chairman Maurice McEvoy who gave me renewed impetus and direction when the future of the project was seemingly lost, he is sadly missed. I have left until last, purposefully, mentioning the main promoter of this project at that inception meeting. He was at that time a member of Community Council with a desire to provide the village with something that would been enjoyed and played by all ages. He is known to most of us as Jack 'Station'. Jack has been fighting ill health for a number of years now, but never fails to spark into life when I call on him. He knows I only call with good news and accordingly he will be getting a few more from me in the next few weeks. At the present time the funding for the construction has been secured, but to establish a good regime of ongoing maintenance, we need your support. So please continue playing the 'Tote' but if that is not possible any donation would help, be it your time, monies (of any amount), a bench or anything else that would enhance the environment of the green. Whatever you give will help this Community project to thrive for many years to come. The responsibility to maintaining this new village asset is for all of us to share for the present and the future and with your support, both individualy and as a community, the vision that Jack had is now a reality, which should go from strength to strength.